Anyone who has visited my house knows that when it comes to eating awesome tasting vegan food, I am not the go-to guy. I am all about convenience and nutrition. When it’s time to eat, I tend to comb the fridge for nutrient dense food, chop it up, put it all in a bowl (or bucket depending on how hungry I am), mix it up, and find something to dress it up with. And half the time I eat standing up. So un-zen I know. On the few occasions that I have been motivated to cook up a proper meal or follow a recipe, I have managed to miss ingredients, prepare things in the wrong order make inappropriate substitutions, or scorch the whole thing on the stove. Cooking just ain’t my thing (or, I should say, I haven’t yet made it my thing). My wife, on the other hand, is the person you go to if you want gourmet meals and she is an awesome vegan chef. She is a natural in the kitchen and has a library of awesome cookbooks on vegetarian, vegan and raw food cooking. Where am I going with this? Oh yes, vegan recipes. I often get asked to suggest vegan recipes for people who want to get into preparing vegan food at home. Before I share what I see as good sources for vegan recipe, it is worth mentioning a couple of common challenges people have when they start making vegan meals. The first is that without meat on the plate, there will be an urge to add more food, often in the form of starch, like rice and potatoes. If you are looking to lose or maintain your weight, multiplying the starch in your meal will be counterproductive, so you will need to be creative in order to fill your plate with lower calorie food. The second challenge with cooking vegan is that you can’t use butter, cheese, creme or other dairy products, which stymies some people who have been cooking for ages. Take these ingredients out and your food may seem bland or flat, so you will need to be creative about non dairy substitutes like nutritional yeast and cashew creme (yumm!!). With these in mind, here are some cook book suggestions and recipe sites. From Chay’s library there are two books that stand out. 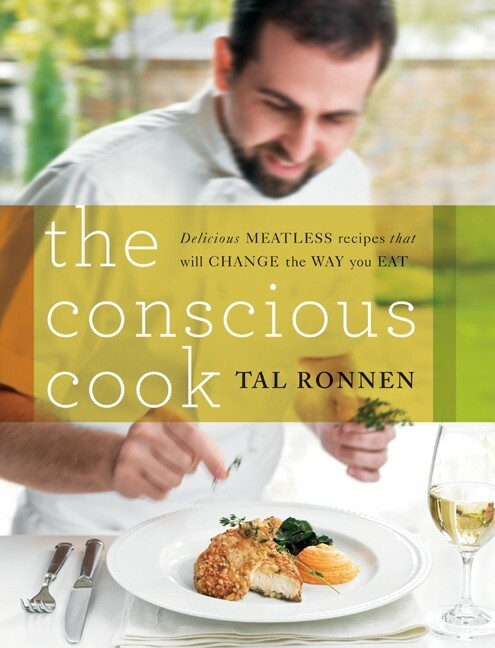 Tal Ronin’s The Conscious Cook: Delicious Meatless Recipes That Will Change the Way You Eat and Colleen Patrick-Goudreau’s The Vegan Table: 200 Unforgettable Recipes for Entertaining Every Guest at Every Occasion . Some others that we have have enjoyed include Vegan Family Meals: Real Food for Everyone , reFresh: Contemporary Vegan Recipes From the Award Winning Fresh Restaurants , Ani’s Raw Food Kitchen: Easy, Delectable Living Foods Recipes , and Colleen’s follow up book Color Me Vegan: Maximize Your Nutrient Intake and Optimize Your Health by Eating Antioxidant-Rich, Fiber-Packed, Color-Intense Meals That Taste Great . I also tend to like the sports performance oriented and simple recipes found in Brendan Brazier’s book, Thrive Foods: 200 Plant-Based Recipes for Peak Health . There are many great sites on the web for vegan recipes. We have tried a few of these recipes, but most are on the list of meals we will cook in the future. Let me know if there are any other good ones we missed. Have fun in the kitchen! Posted on: August 22, 2011 Comments: 0 Comments - Leave a comment!